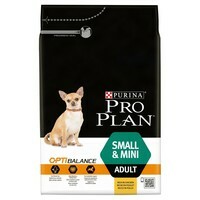 Purina Pro Plan OptiBalance Small & Mini Adult Dog Food has been carefully formulated to give your small or mini breed dog the best nutrients for their health needs. Rich in chicken and containing a combination of specifically selected nutrients at appropriate levels for your dog’s size, Purina OptiBalance helps to take care of your dog’s heart, teeth and joints. Purina OptiBalance Small & Mini also helps to improve your dog’s intestinal health through fibre content.